MANILA, Philippines – Torture and illegal detention are still being committed by government forces in the Philippines, and they must be stopped, human rights groups said on the occasion of the United Nations International Day in Support of Torture Victims, June 26. Around 200 activists and human rights advocates marched from Avenida to Mendiola to protest the Aquino administration’s alleged use of torture to extract information from illegal detainees. Torture is still prevalent despite the administration’s good governance campaign, according to Karapatan chairperson Marie Hilao-Enriquez, a victim of torture during the Martial Law years. “No matter how the Aquino government denies the use of torture, state security forces in the Armed Forces of The Philippines (AFP) and the Philippine National Police (PNP) resort to and apply it to their victims, inside and outside prison,” Enriquez said. Members of the non-governmental organization Karapatan led the rally attended by militant organizations including Desaparecidos, Kilusang Mayo Uno, and Bayan. 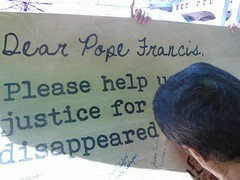 Citing a few cases, Karapatan and Desaparecidos maintained that torture and enforced disappearances are happening nationwide. In Quezon City, security guard Rolly Panesa was reportedly mistaken for a top-ranking leader of the Communist Party of the Philippines (CPP). He was taken to Camp Vicente Lim in Canlubang, Laguna, where he was detained and allegedly tortured. On February 28, 2012, ten soldiers of the 87th infantry brigade of the Philippine Army (IBPA) in Samar allegedly tortured suspected gun owners Richard Oblino, a 25-year-old farmer, and 16-year-old nephew Orlan. Meanwhile, Cesar Garganta of Macalelon, Quezon was beaten up for 3 hours by soldiers of the IBPA. The soldiers insisted that Garganta was a member of the New People’s Army (NPA). During the first half of the Aquino administration, Karapatan claimed it has documented 76 incidents of torture. These numbers registered more than half of the 128 recorded cases under former president Gloria Macapagal-Arroyo’s administration, the group said. 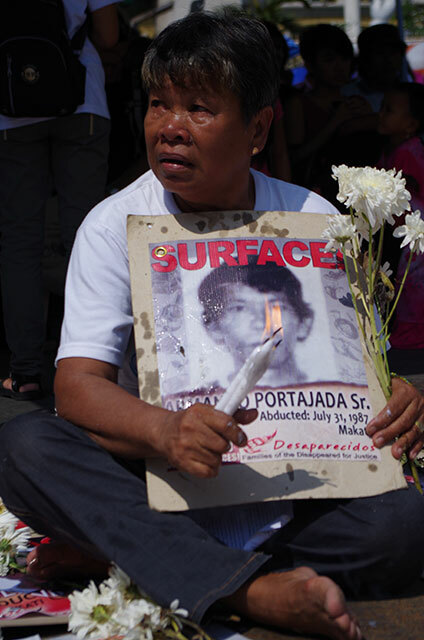 Families of Desaparecidos for Justice secretary-general Lorena Santos said that 16 cases of disappearances have been recorded. “In fact, two incidents of enforced disappearances were reported right after the enactment of the Anti-Enforced or Involuntary Disappearance Act of 2012,” Santos added. 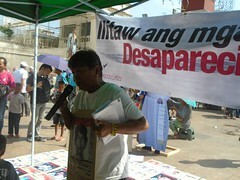 Enriquez further accused the government of violating its own laws. “The Anti-Torture Law…has not prevented the government to use torture to extract information from detainees or abducted persons,” she added. Karapatan and Desaparecidos accused the government of using Oplan Bayanihan, the government’s counter-insurgency program, as a tool to illegally detain suspects. “The government cannot fool the people by simply dishing out pro-human rights hype in media…Aquino cannot dismiss the torture victims as isolated cases,” Enriquez said. Rappler tried to get the side of the Palace but still has not gotten a reply as of late Wednesday evening. The Anti-Torture Law of 2009 was enacted to criminalize torture and other inhuman treatment and punishment of persons. It seeks to eliminate impunity and abuse of power in the Philippines. The bill took 23 years in the House of Representatives before it was enacted into law. On December 21, 2012, President Benigno Aquino III signed the Desaparecidos Bill into law, making the Philippines the first country in Asia to have such a legislation. The bill makes the crime of enforced disappearance punishable by life imprisonment. 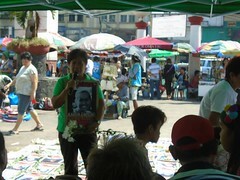 Filipinos must do their part in condemning and stopping such violations of human rights, Enrique stressed. President Benigno Aquino III should be more careful about what he says. What does she mean by that question? In an interview with Radio New Zealand last Tuesday (October 23) President Aquino was asked regarding the administration’s record on human rights abuses and his comment on groups that are critical of the government’s alleged inaction on the cases. “Well, we won’t claim that there are no human rights issues within our country. But I think in the past two weeks, for instance, we’ve had a lot of abuses done on state agents. When they were enforcing, for instance, eviction notice on land issues, they were pelted with human waste and a lot of danger has happened to our people. Perhaps I keep saying that human right is for everybody. Not because you’re… a government employee that your rights are any less than any other citizens,” Aquino said in the interview. Why was there no mention of what happened on the morning of October 18 (just last week) in Tampakan South Cotabato, when two-months pregnant Juvy Capion, wife of anti-mining Blaan tribe leader, was killed with their two children who are 8 and 13, whose bodies were dragged out of their hut with bullets on their heads… or was it “propaganda”? because allegedly, Armed Forces of the Philippines 27th Infantry Battalion happened to be at the scene? What about Jonas Burgos’ case, Maguindanao massacre, and the hundreds of nameless faces who are victims of torture, extrajudicial killings, and enforced disappearances? 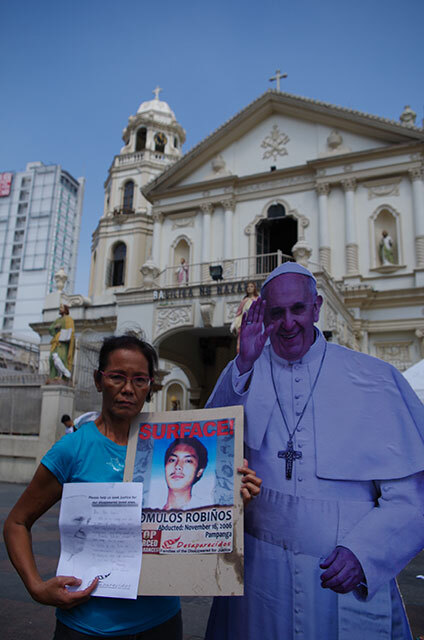 In Burgos’ statement, she said, “To call this propaganda and to label it leftist is the height of insensitivity to a mother who continues to search for her missing son. I stand before the Lord, who is truth Himself, in witness of this truth. Since 2007, together with families of “desaparecidos” (disappeared), the Burgos family has always been upfront with the military to surface Jonas. “Now, when you are looking for a missing loved one, is it justified to label you as leftist? Unless the definition has been changed, I would not subscribe to what has been officially said by Malacanang. To seek justice and to right a wrong done to families who have been victims of enforced disappearances, will that be considered a leftist act?” Burgos asked. They cited institutions like the United Nations Special Rapporteur on human rights defenders, Human Rights Watch, Amnesty International, and other organizations here and abroad who’ve also raised their concern on the continuing human rights abuses in the country. Was the President just misinterpreted with the use of the word “propaganda”? Or was it a way to deflect a rather confronting question? But it can be healed–if the question of the victim’s mother or father, sibling or child finally receives a truthful answer.